With the 2016 White House Correspondents' Dinner right around the corner on Saturday, April 30, America’s A-listers are gearing up for the event held in Washington D.C. every year. From journalists to politicians to celebrities, modern movers and shakers will be rubbing elbows this weekend in the capital, regardless of job title or political affiliation — which is all part of the event’s charm and spectacle. So, how can those of us who are not part of the media elite get in on the action? What time does the White House Correspondents' Dinner start so when can watch it on TV and feel like we're there too? Like any A-list event, the White House Correspondents Dinner is not just one event on one platform. Pictures, videos, and posts trend throughout the weekend stemming from unlikely pairings sighted on the red carpet, who Obama and the host (this year it’s Larry Wilmore) roasted during their speeches, and gossip from pre-event soirees, after parties, and next day media brunches. But, if you are planning on tuning in at home, C-Span has announced that its red carpet coverage will begin a 6 p.m. ET, dinner coverage kicks off at 7:30 p.m. ET, and the entertainment portion of the evening (including Obama and Wilmore’s speeches) will start at 9:45 p.m. ET. CNN will begin its coverage of the event at 7 p.m. ET. With so much buzz about the event and a guest list with every recognizable name in media, it’s easy to be curious about what actually goes on inside and what television viewers can watch at home. Based on previous years' coverage, here’s what usually happens, hour by hour, at the White House Correspondents' Dinner. Guests begin to arrive at the Washington Hilton Hotel’s red carpet, which apparently isn’t as luxurious as you may imagine, according to Bustle’s 2015 coverage. Pre-parties and red carpet action are in full swing. Last year, the Washington Post reported that celebs were walking the red carpet and sharing pre-event pics and videos on social media. 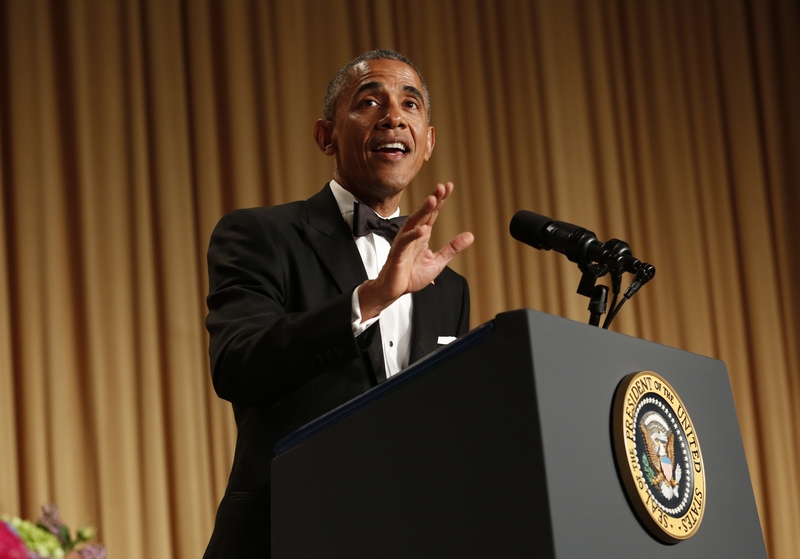 At 8:40 p.m. at the 2015 White House Correspondents Dinner, the Washington Post’s timeline stated that dinner was in full swing. The Washington Post reported that at about 9:50 p.m., White House Correspondents’ Association President Christi Parsons took to the podium. Just after 10 PM, journalism scholarships and awards were announced. According to the Washington Post, it was showtime. Obama took to the stage and began delivering bi-partisan zingers. After Obama’s set, the host will conclude the evening. This year, Larry Wilmore, of Comedy Central's The Nightly Show, should take the stage by this time. While the television coverage may have ended, the night is really just getting started with after parties planned into the following Sunday. So even if you weren't personally invited to the White House Correspondents' Dinner this year, there should be plenty to watch and read about all weekend once things get started on Saturday, April 30 at 6 p.m. ET.